Multiple Warehouses - what's the intended way to manage this? I have purchased multi-inventory to do more in-depth testing, and I can't really understand some of the concepts here, as it's not very standard compared to other inventory management system terminology. a) The locations feature - This should only be used to describe the location with 1 warehouse. E.g. a rack, shelf, bin etc. b) Multi Inventory - Assume you have 1 product with the SKU: ABC123. This product is stored in warehouse A and warehouse B. Warehouse A is for shipping to the USA and warehouse B is for shipping to Europe. How are you supposed to describe the location of that warehouse when adding each inventory? If it is the inventory name, then why do these have to be unique? When I add a second product, it should have the same warehouse name. Have you read the documentation? I will be doing a video tutorial soon, hope it helps. Read your a and b, is this a question, suggestion or? you create location and add it to the inventory that belongs to it. Name is optional and only for better orientation. Inventory name and location has no connection. Sorry, I should have been more clear. Point A was a question. The documentation reads to me as such, that only a local description of the inventory location should be put in the location field. E.g. The rack or bin number, NOT the ultimate warehouse name, that contains all stock. The area I am finding illogical compared to the other warehouse management and inventory systems I have used is the hierarchy. Usually, the system would be like this..
How would you suggest this is applied to the ATUM system? When viewing inventory, you would see it based on the warehouse it is in, its location within the warehouse. The inventory names that have to be unique are shown instead, which is not very useful information, and they can also not be left blank. Meanwhile, I have a simple product with 2 inventory entries added. I have set a location on each. When looking at the stock central main screen, there is no mention of this location. There is a 'location' column, but its empty? Locations work exactly as you meantion and seem to be working fine looking at your images. I do not think is illogical as it works exactly as you said. You need to create locations as a hierarchy, same as you would create product categories. Stock Central should show you those when you click the UP arrow icon with the little 2 digit. As soon as you create a multi Inventory TSUGARU record is a container in SC. Hope this helps. Anyone using multi-inventory is going to want better visibility of counts in locations. So the count per location should be a column in the multi-inventory section. The 'inventory name' should be optional, or automatically generated. It's way too much work to try and find a unique value per product, especially as we can't do anything in bulk. It feels like this should be more of a unique key, rather than user-facing. SKU's - its best practice to not store the same products under different SKU's. Within multi inventory, the SKU's should default to the same as the parent. Inventory names are optional, they are to help you organise your work. you get the top inventory named Main Inventory by default as it takes priority (this could be the UK stock if you will). You setup country or zone restriction here for the UK. Lets say you have these socks in your underwear warehouse in Isle A shelf 32 (so you set up Parent Location as UK Underwear Warehouse, Child location Isle A and another Sub Child Location as Shelf 32, the you just add shelf 32 as location to the inventory). the second inventory you can name or just type number 2 (up to you). The name is there to give you options of organising your work. Rest you do the same you did in point 2. SKU - maybe for you. there is tons of industries that have different SKUs within the same product. You may have same product made by different manufacturers or other reasons. It takes only few seconds to copy paste the same SKU for all of these if needed. We do plan to release bulk editing feature later on in the dev stage. If requested by more users, we will add the bulk edit of these too. On the other note, we have already considered giving an option for users to set one SKU per product by default. We ask users to be patient as lot more features are coming int. That is why users like you are very valuable as we want to hear all opinions and suggestions. 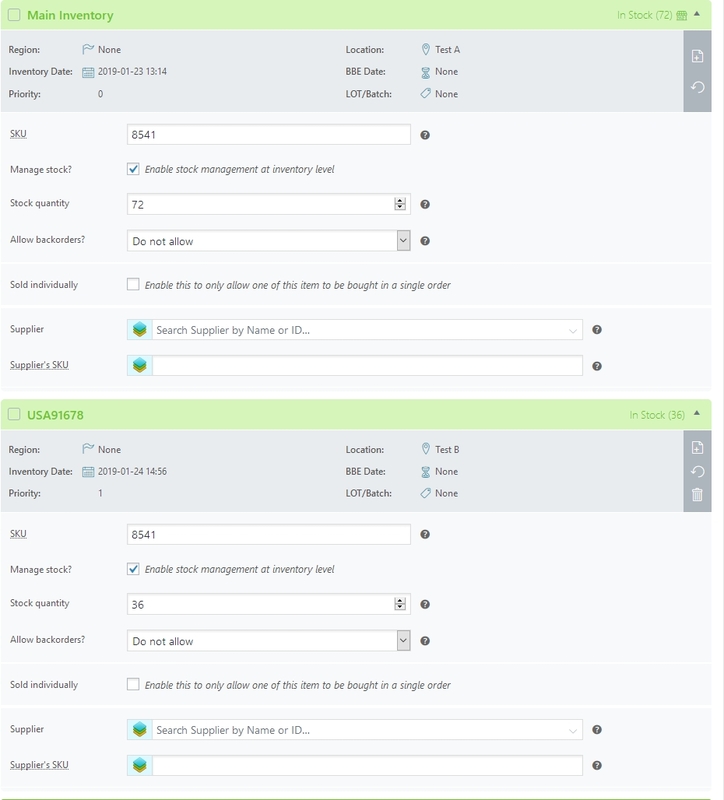 Forum_Admin Inventory names are optional, they are to help you organise your work. You have to enter a name to add a second inventory, so I say this is compulsory. Forum_Admin the second inventory you can name or just type number 2 (up to you). As you had too here. I guess ATUM suits separating stock in one geographic location from your description? Our use case is stocking the same products in multiple geographic locations and then shipping to the customer from the warehouse with the fastest / cheapest route. Like fulfilment by Amazon. Yes, correct, sorry for using word 'optional' I was referring to the option of naming it. However, this works exactly like Amazon FBA and that was the point of starting this feature. Amazon does as well ship according to destination address and not address of the buyer. I feel that somewhere along this post is a misunderstanding between us and I apologise about that. martynpearson Our use case is stocking the same products in multiple geographic locations and then shipping to the customer from the warehouse with the fastest / cheapest route. Like fulfilment by Amazon. exactly, point of MI is to stock different product in different locations or have different batch numbers/expiry dates within one location. we have tons of other options coming in as well as the user choosing the warehouse of shipment. Please, do explain to me the ideal scenario for your business step by step with real examples? I've been making progress with your guidance. 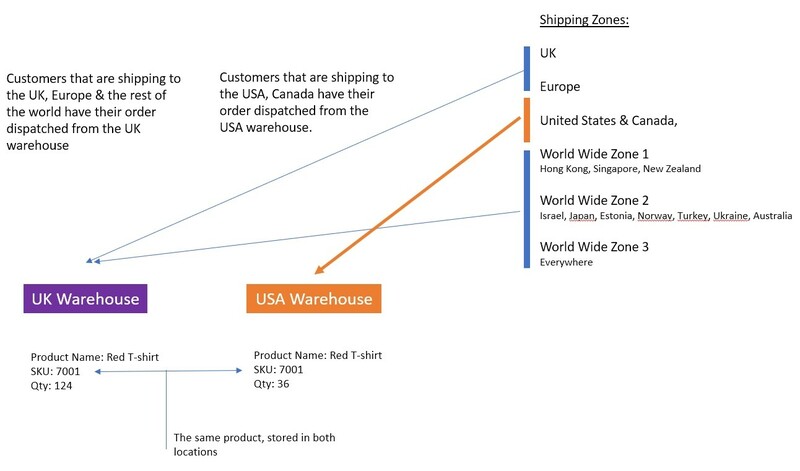 My issue now appears to be that ATUM does not allow the use or work the way WooCommerce does with the Locations not covered by your other zones, with the "Locations not covered by your other zones" I created the below diagram from what I am looking to achieve. First step is to create zones in WC settings. Default Zone - pick one that will be used in case zoning fails. Expirable Inventories - active if you need to use this option. Within your products, assuming you do not have different batch numbers or expiry dates. When your visitor comes to the site the system will show the default shipping zone as set in Step 2. If a visitor is logged in and has already set the delivery address the stock shown will represent that zone. When a visitor only sets the shipping address in the basket the stock will update then (risk that if your default zone has stock, but visitor sets shipping to a zone with no stock the purchase will fail as the system will show him "no stock" message). After the purchase the correct stock is deducted. Thank you very much. This is magical. I will discuss your setup with the senior dev on Monday and report to you soon after. Great, so this is what I got to. Can you confirm too, that if you are using the built-in WooCommerce Geolocation, then the shipping country will be guessed at by country upon the first visit? I do not think it has anything to do with zone restrictions.